On request, we also offer online training courses! Philosophically, Structuristic Art Studies represent an all-encompassing, fully defined style of visual arts. It is based on an innovative and independent foundation that is both theoretical and practical. The training provided is not academic but in the format of an art apprenticeship. In other words, no prior knowledge, passing of acceptance exams or special talents are required. The only aspect that is assessed is performance. In order to keep tuition at an absolute minimum, the teachings are designed in compliance with the latest pedagogic aspects and are divided into stringently organized modules. This makes it possible to save time without having to compromise when it comes to quality. Consequently, Structuristic Art Studies underscore the social-economic aspect according to which education should be made accessible to benefit as many people who have a desire and the commitment to learn as possible. The training can begin at age 18 and in exceptional cases – subject to the consent of parents or legal guardians – also at an earlier age. Prospective participants have the option to choose the line-up and timing of their modules at their own discretion within 2 years. Hence, it is possible to complete the training consecutively as a focused education program or in phases. The entire education that ends with the graduation as a Structuristic Teacher comprises four modules. This module teaches the very basics of Structuristic painting. Students familiarize themselves with the fundamentals on materials, color and form as they apply them directly in their practical work. They are also already introduced to art history. This knowledge is further expanded during every subsequent course. As a result, they acquire a step-by-step profound overview of artists, styles and epochs. Students who successfully complete this first course will be rewarded with a Certificate of achievement. In this second course, the skills acquired during the first module are fine-tuned and deepened. 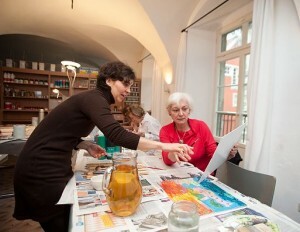 In their practical work, students expand their abilities in the Structuristic technique creating collages. Free hand drawing is used more frequently, and the up-and-coming artists are practicing proportional and composition aspects, while they are also learning the basics of perspective. This course ends with a practical and theoretical exam. Those who pass the exam receive the Certificate of Structuristic Practitioner. During this advanced module, students are introduced to the philosophical background of Structuristic Art Studies. Another focus is the systematic analysis of paintings based on symbolic and psychological elements. As they progress through the third module, course participants complete three paintings on their own at home, which are concisely logged. This course will be concluded after the completion of 60 study hours and the submission of three works. Graduation from the program will be certified by a Structuristic Artist’s Certificate. For those who do not want to merely work as artists on their own, but have the desire to also teach this constructive art style themselves, we offer the fourth module, in which they advance to the degree of an assistant teacher. Under supervision, participants of the course have the opportunity to teach beginners and to introduce them to the basics of Structuristic Art Studies. The pedagogic-didactic and artistic-social elements are analyzed down to every intricate detail and practiced so that participants who complete this course are perfectly ready to open their own Structuristic Art School. A practical and theoretical exam will be conducted at the end of the course. The exam will focus in particular on the subjects of Modules 3 and 4. Upon successful completion of the exam, participants will be issued a Structuristic Teacher’s Diploma. The modules have to be paid in advance. All participants are obliged to purchase an own painting set. Note: Graduates of all four course modules, who want to engage in Structuristic painting as a simple recreational activity or as one of their key passions, have the opportunity to book single lessons through the subscription portfolio to regularly or sporadically hone and refresh their skills. Exams are conducted at the end of each of the advanced modules 2, 3 and 4 and do require additional time (modules 2 and 3 = one half day each; module 4 = an entire day). The dates for exams will be scheduled with participants in due time. The exam fee for each exam is EUR 50,-. The fee includes materials and VAT. In the event that a participant should ever not pass the exam, he or she will have the option to take 12 additional lessons at half of the regular tuition cost in order to subsequently participate in the previously failed exam again. If the participant should require or want to participate in more than 12 lessons, these additional lessons will be available; however the regular course rate will apply. The faculty will always strive to assist every participant to pass their exams, although there definitely are no free rides and only the personal commitment of the students will yield the achievements they deserve. The exam fees also have to be paid in advance – either in cash or via bank transfer.